I gave my Percha Kucha project on the current state of Zionism in the modern world. Cultural conflict has always been a very attractive topic for me, and of all those conflicts going on in the modern world right now, none interest me more than the current state of affairs between Israel and Palestine, I sympathize with the Palestinian plea, so as a result I often side with them like I did this time, but I’ve been known to play the devil’s advocate before. Seeing as our class focus is data, information, and culture, I gladly rose to the challenge to see if I could tie this concept to that of data and information. In order to pull the topic of the Palestinian Israeli conflict into the realm of data and information, I used stats and infographics almost entirely to construct my argument. This picture is a snapshot of a stat taken from the current conflict and it compares the suffering of the Palestinians to the Israelis, bringing light to the fact that the Palestinians are a whole lot worse off right now than the Israelis are, which is the exact opposite of what most people think, therefore making it a very powerful tool in my argument. I also made wide use of infographics. 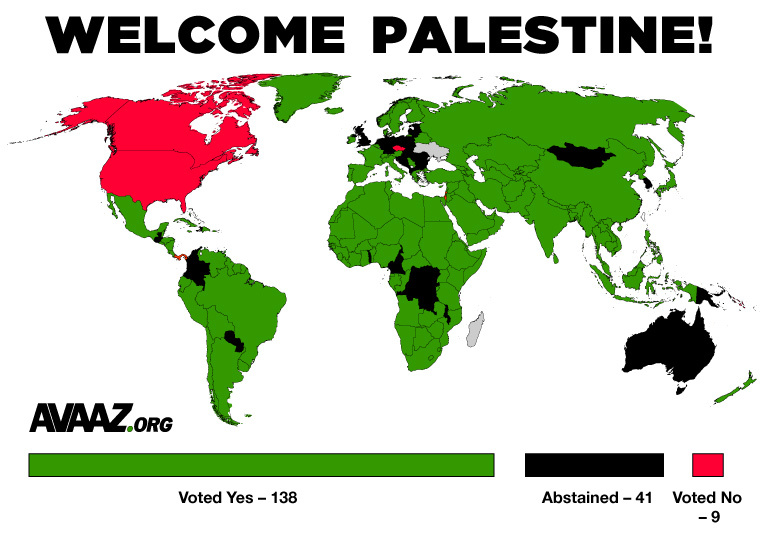 This picture I used clearly demonstrates the how much of the world actually supports Palestine today, and serves the clutch purpose of providing me a lead into the next topic of the presentation where I go on to talk about how the U.S. is very much at fault for giving Israel more than enough supplies in order to continue to oppress the Palestinian people. It also offers an explanation for why the UN has failed to act on its many resolutions it has created against Israel, as the U.S. is often times spearheading any type of UN action. In the process of preparing my presentation I quite a few major obstacles to overcome, the most notable of which being to give concession to the Israelis. There are plenty of people in this world that identify themselves with Israel as a whole, and my goal is to show that Israel is simply wrong in nothing but its actions towards Palestinians. I made it of upmost importance not to come off as a racist during my presentation, for that would hurt my argument a great deal for sure. Previous PostSewol Ferry – Pecha KuchaNext PostHas Big Data Changed the Game of Soccer?